Agony for Josh Rosser of Peterborough Northern Star at Redbridge. Photo: Chantelle McDonald. @cmcdphotos. Deeping Rangers and Holbeach United fly the local flag into tomorrow’s (November 5) FA Vase third round draw. The United Counties League Premier Division title challengers both won tricky second round away ties yesterday (November 3), but there was disappointment for Peterborough Northern Star who went down 1-0 at Redbridge. A goal just past the half hour mark saw off Star who battled gamely to the end. Jake Sansby (stripes) of Peterborough Northern Star in action against Redbridge. Photo: Chantelle McDonald. @cmcdphotos. Two Danny Durkin goals secured a 2-1 win for Deeping at Wantage Town. The winner arrived 10 minutes into the second-half after Wantage had equalised Durkin’s first goal before the break. And Joe Braithwaite’s 20th minute goal and a last-gasp Jack Smith strike earned Holbeach a 2-0 win at Wodson Park. Second-placed Pinchbeck United took advantage of cup action for a couple of rivals by delivering an impressive 3-0 Premier Division win at home to Eynesbury, although they were helped by three red cards for visiting players! Two players were sent off in the opening 15 minutes and another 10 minutes into the second-half. Ollie Maltby, Tony Edwards and Lee Beeson scored the Pinchbeck goals. Matt Barber (stripes) of Peterborough Northern Star in action against Redbridge. Photo: Chantelle McDonald. @cmcdphotos. The Knights are five points behind leaders Daventry with a game in hand. March Town’s steady climb up Division One North of the Thurlow Nunn Eastern Counties League continued with a 3-1 home win over Diss. Rob Conyard (2) and Jack Rawson scored for the Hares who are seven unbeaten and up to sixth in the table. And credit to Wisbech St Mary who bounced back from a 10-1 hammering last weekend to beat Leiston Reserves 4-1, Former Peterborough United youth team player Jack Friend scored all four goals. 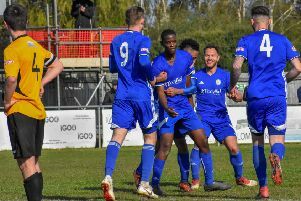 Second Round: Redbridge 1, Peterborough Northern Star 0; Wantage Town 1 Deeping Rangers 2 (Durkin 2); Wodson Park 0, Holbeach United 2 (Braithwaite, J. Smith). Premier Division: Pinchbeck United 3 (Maltby, Edwards, Beeson), Eynesbury Rovers 0. Division One: Bugbrooke St Michael 3, Blackstones 0; Harrowby United 2, Bourne Town 2 (Munton, Bottreill); Northampton Sileby Rangers 6, Huntingdon Town 0. Division One North: March Town United 3 (Conyard 2, Rawson), Diss Town 1; Wisbech St Mary 4 (Friend 4), Leiston Res 1.